I had originally ran a stack all the way through this subject, front to back. But it looked to "busy" and confusing so I went back and ran just the frames to get the face, antenna, and legs. This was taken with a 10X Nikon M Plan objective, mounted on the front of a camera bellows, the camera was a Nikon D200. 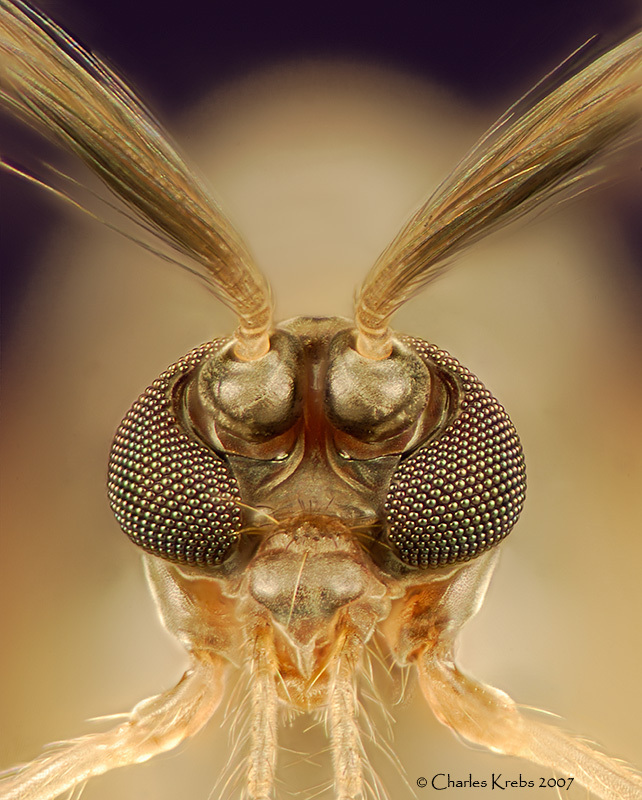 The extension used gave a magnification of 16X, and the midge head measures 0.63mm across. I looked at your pictures and you seem to have the process down. I have been playing around with Helicon, but not getting satisfactory results. I am using a Canon 24-105 F4L IS USM lens with extension tubes. I am on a tripod, using cable release with the mirror locked up. I am getting ghost images. Is it possible that I may have to get a true macro fixed mm lens to do this? The 24-105L is a very good lens, but not really a great choice for this kind of magnification. Since you already have extension tubes, a better (but relatively inexpensive) choice would be a reverse mounted enlarging lens or 50mm normal lens (f1.8 or slower). You will also need a way to either move the subject or the camera/lens in small increments (with the least amount of "wobble" possible). Not sure what you mean by "ghost images". It is not at all uncommon to have some residual "haloes" around some subjects depending in the picture. Setting different parameters and modes can minimize this, but it will sometimes still be necessary to do some retouching.